The Clark Honors College is seeking applications from all faculty — tenured, tenure-related and career nontenure-track — from across all colleges and fields at the UO to serve four- and eight-year terms as faculty in residence at the honors college beginning in the 2018-19 academic year. 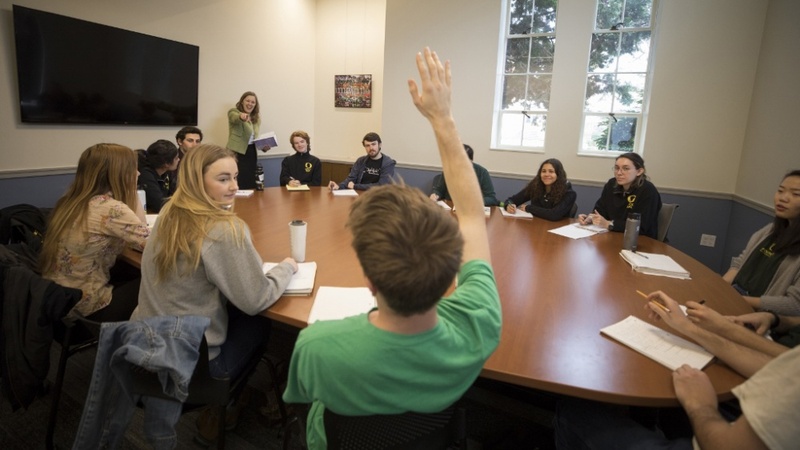 The new faculty-in-residence model allows faculty members with a primary affiliation in any of the UO's schools or colleges to move some or all of their teaching and service into the honors college while remaining a part of their existing research home. Terms of four or eight years are available, with four-year positions intended to provide flexibility for those who can commit only a fraction of their teaching and service to the honors college, while eight-year positions are intended for those who will commit most of their teaching and service to the honors college. The honors college will work directly with department heads to coordinate teaching reassignments as needed if department schedules for the 2018-19 academic year have already been determined. Teaching commitments for incoming faculty in residence in the honors college can be flexible, especially during the first year as the program transitions to this new model. Make the honors college more accessible to a wider range of students and a diverse community of faculty members. Increase curricular breadth and course offerings across the disciplines represented at the UO. Build a closer partnership between the honors college and other academic units on campus. The UO Board of Trustees voted March 2 to reduce honors college differential tuition by 35.6 percent from $4,194 per year to $2,700, a first step in addressing the goal of a more accessible honors college. The college is now moving forward with faculty recruitment, the next step in building a more diverse faculty and a greater range of disciplinary expertise among faculty members in the college. Complete details can be found on the honors college website.